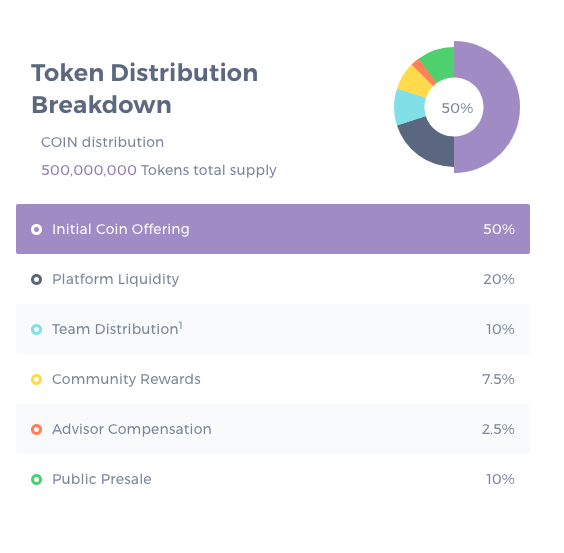 Everything you need to know about the CoinMetro Token Sale. During the period of the Token Sale, the price of each COIN will start where the pre-Token Sale left off up to a maximum initial price of EUR 0.11 per COIN if all 50 million COIN were sold out during the period of the pre-Token Sale. If the number of COIN sold during the pre-Token Sale does not reach 50 million, the price of COIN during the Token Sale will begin at the price where the pre-Token Sale ended, and it will follow the pre-Token Sale milestones until the total 50 million COIN are sold. This price will increase by EUR 0.01 each time the Token Sale hits a 50 million softcap. The Token Sale hardcap is set to 300 million COIN, including the 50 million COIN allocated to the pre-Token Sale. *“TBPR” stands for “Token Buyback Program Reserve” (See section 4.0.5 from the White paper); which is an account funded by a share of net profits from CoinMetro and FXPIG used to buy COIN on CoinMetro’s open exchange to promote a stable pricing environment. **Commissions reduced to 0.075% maximum on all exchange volumes and equivalent discounts (25%) on all CoinMetro fees. The discount does not carry over on fees to external providers, TAM managers, or other services not directly priced by CoinMetro. ***Commissions reduced to 19 per million maximum on all traded volumes across all available platforms. The discount does not carry over on fees to external providers, PAMM managers, or other services not directly priced by FXPIG. Once 200M COIN are sold during the Token Sale, participants will enjoy lifetime discounts on applicable fees tied to CoinMetro and FXPIG services on both company’s platforms. Token Sale participants will be privy to private invitations and exclusive opportunities concerning all future Token Sales offered by any of CoinMetro’s founders, as well as special pricing on select Token Sales launched via our ICO Express Platform. If all COIN tokens are sold during the Token Sale, as intended, the final COIN value, following the pre-Token Sale and Token Sale, will be EUR 0.15 per COIN. This will be the initial trading price for COIN at the time of its public debut on CoinMetro’s exchange.